At least in the pages of the "Love Finds You" book series! This is a friendly reminder that Sunday (December 4th) marks the beginning of the "Love Finds You" blog party taking place right here at this very blog! There will be some really fun interviews and giveaways to get you in the Christmas spirit, so I do hope to see you there. And don't forget (if you haven't already!) to check out the party page to see the schedule and learn how to gain extra entries in the main prize package drawing! While we're on this "Love Finds You" theme, there are new covers up on the Goodreads site for a couple of February 2012 LFY releases. Care to see them? They're quite lovely! "Finley Sinclair is not your typical eighteen year old. She’s witty, tough, and driven. With an upcoming audition at the Manhattan music conservatory, Finley needs to compose her audition piece. But her creativity disappeared with the death of her older brother. She decides to travel to Ireland following his travel journal. It’s the place he felt most alive – and she desperately needs to feel alive again. So she agrees to an exchange program and boards the plane. Beckett Rush, teen heartthrob and Hollywood bad boy, is flying to Ireland to finish filming his latest vampire movie. On the flight, he meets Finley. She’s the one girl who seems immune to his charm. Undeterred, Beckett convinces her to be his assistant in exchange for his help as a tour guide. Once in Ireland, Finley starts to break down – the loss of her brother and the pressure of school, her audition, and whatever it is that is happening between her and Beckett, leads her to new – and dangerous – vices. Then she comes across something that changes her perspective irrevocably. Is it enough to convince her that everything she’s been looking for has been with her all along?" Wow!! The charm of Ireland, the angst of young adulthood, and the beautiful craziness of life come together to make this an engaging, moving read! 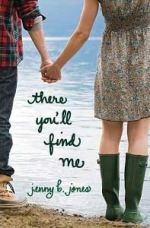 Jenny B. Jones has a winning and creative writing style that somehow combines humor and sincerity in a way that keeps the pages turning and the journey going. And this is one journey that I'm so very glad I took! There You'll Find Me features quite a cast of quirky characters, many of whom charm the reader's heart despite their unique first impressions. Even though the hero seems a bit too good to be true and the mean girl seems a bit too awful to stand, the story is wonderfully told. It's heartbreaking to witness the events unfold, and yet there's enough sweet surprises and fun scenes to make it an ultimately enjoyable read. This novel comes disguised as a diversionary YA book, but in reality it digs deep and refuses to shy away from painful questions and situations. Brimming with emotion and overflowing with hope, this book stole my heart. Is there a list for new Jenny B. Jones fans? Because if there is, well...there you'll find me. "Reeling from an unexpected betrayal, can Sylvia find relief from the echoes of her past…or will they shape her future forever? Can Aaron and Sylvia find common ground? Or will their unflinching efforts toward opposite goals blur the bigger picture— a path to forgiveness, glimpses of grace, and the promise of love." The "Ada's House" series features some powerful stories full of healing and hope and love. The Harvest of Grace is a wonderful, fitting conclusion to the Amish trilogy. 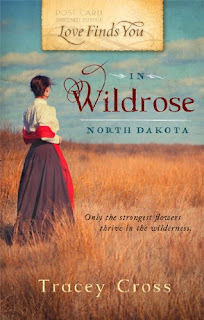 While Woodsmall catches all readers up-to-date at the beginning of this book (making it possible to read this novel as a stand-alone if desired), the series really shines as a whole - with all three books coming together to look at the gem of God's love and the love between people from various angles. Sylvia is a new character introduced in this book - a stubborn farmer determined to escape her past and prove herself by saving the Blanks' farm where she now works. Aaron is a familiar face, but in this installment the reader gets a closer look at his motivations, including his desire for acceptance. Both are hurting souls that are seeking a harvest of grace. Other familiar friends from The Hope of Refuge (Book 1) and The Bridge of Peace (Book 2) share the spotlight in this gentle story full of flawed characters and raw pain. The romance is sweet and the lessons on honest, forgiving love are even sweeter. Woodsmall has done it again! 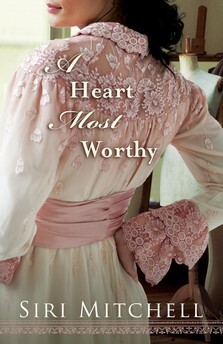 Congratulations to Leah, who won my gently used copy of A Heart Most Worthy! You have until next weekend to respond to my e-mail so I can get the book out to you. =) Enjoy! More giveaways to come during the "Love Finds You" blog party starting next Sunday!! ...at least on my blog, anyway! I hope you all had a wonderful Thanksgiving! I'm so grateful for your friendship, your encouraging comments, and your willingness to take time out of your busy lives to visit and read my posts. Thank you for being my friends! And now we are heading toward the next holiday - Christmas!! I'm sorry if I'm a little too early for some of you... Hope you don't mind my enthusiasm! The Scrappin' Blogs website has so many lovely blog backgrounds to choose from, and I love this one with its gentle backdrop and cheery splash of color. The main picture is from last winter at my school (I think this was in February, featuring a very rare dusting of snow). I really am blessed to have such a beautiful view! May the picture remind you of the peace to be found on His path for our lives no matter the season or weather. P.S. Don't forget that the "Love Finds You" blog party starts on December 4th! Just a little over a week to go!! CHRIS FABRY is a graduate of W. Page Pitt School of Journalism at Marshall University and Moody bible Institute's Advanced Studies Program. Chris can be heard daily on Love Worth Finding, featuring the teaching of the late Dr. Adrian Rogers. 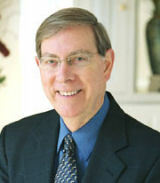 He received the 2008 "Talk Personality of the Year" Award from the National Religious Broadcasters. He has published more than 60 books since 1995, many of them fiction for younger readers. Chris collaborated with Jerry B. Jenkins and Dr. Tim LaHaye on the children's series Left Behind: The Kids. His two novels for adults, Dogwood and June Bug, are published by Tyndale House Publishers. Chris is married to his wife Andrea and they have five daughters and four sons. If you'd like to read the first and second parts of the story, click HERE and then HERE. And please join me after the conclusion to learn more about the facts behind the fiction! Alice brought her jar of pennies to church that wondrous Sunday when Randy came back. She stayed after church much longer than she usually did, because everyone else wanted to thank Randy for his service and ask him about his experiences. If you and I were there, we would have been able to tell them that Randy really didn’t want to talk about his time in Vietnam. At least not yet. Finally, Alice was able to approach Randy, tug on his sleeve, and hand him the penny jar. I wish I could tell you that he looked at that jar of pennies and other coins and simply knew how much they were really worth. As it was, he did give Alice a hug and a pained smile. He said, “Thank you,” and, “I missed you.” And then he turned to talk with another person. For many years that jar sat on Randy’s desk. Alice passed away; Randy got married and started his own family. While he didn’t think of the penny jar very often, he smiled when it caught his eye. He thought of Alice’s hugs and her pockets full of candy. Randy would never know all the heart that went into that jar of pennies. And as much as I like to pretend I know such things, I really can’t fully comprehend it either. But forty years after he was drafted (I’ll wait if you’d like to do the math)…Randy’s oldest son surprised his father with a trip to Washington D.C. Randy brought the penny jar with him. The whole family went, and as they visited the war memorials, Randy was finally ready to share some of his stories. I walked with him that sunny, humid summer day to the Vietnam War memorial. It looked like the wall of a trench, covered with names. Grandpa Randy found the names of some of his Army buddies. I cried when I saw silent tears fall down his stoic face. And then he asked me to hand him the penny jar, the one I had been holding ever since we left the hotel. The yellow ribbon was a bit tattered, but it was still there. The pennies were gone, though. Grandpa said that he was saving them in another jar, to share with someone else someday. His knee gave a satisfying pop as he knelt down to place the jar on the ground beneath that multitude of names. I wouldn’t say the jar was empty, though, despite the missing pennies. If you had seen the light in Grandpa’s eyes and the way the sunlight filled the jar, I think you would have seen what I saw - hope. As I've previously mentioned, this short story is fictional, but inspired by some real elements. As a young girl, I used to attend First Covenant Church, where an older man named Jim Worthen and his wife Evelyn sat in the pew behind my grandparents. Mr. Worthen would bring me candy, and he and his wife always had a smile and a kind word for me. They were so very sweet, and their presence in my life brightened my Sundays. And then one day Mr. Worthen passed away. And eventually Mrs. Worthen asked me to come and visit her. She gave me a jar filled with pennies and a few other coins, telling me that Mr. Worthen had been filling it and saving it for me. It was a gesture that touched my heart - to think that he had been saving up those pennies especially for me! And that jar of pennies still sits in my room back at home, a beautiful reminder of the power of kindness and thoughtfulness. I certainly couldn't comprehend when I was younger, and I still can't today, just how much heart went into that simple gift. While "The Jar" is definitely a work of fiction, and I claim sole responsibility for any mathematical or historical errors, I hope it's foundation in real life will inspire you. The brave military men and women who sacrifice so much for our freedom. Family and friends who surround me with love. The simple but profound gift of a jar of pennies. What are you thankful for this Thanksgiving? And is there a gift that has blessed you, with a story behind it that will bless others? If you missed Part 1 of "The Jar," click HERE. The conclusion will be posted tomorrow! What is a medium-sized jar that once held rutabagas good for after said vegetables have been removed? Alice was just as unsure as you and I for a time, but a few days after Randy had left on his way to Vietnam, Alice was given some change from the grocers. Just some pennies and a couple of dimes. Instead of putting them back in her purse, she put them in her pocket. And when she got back to her trailer, she approached the jar glistening on the windowsill, twisted the lid off of it with a satisfying pop, and dropped the coins into it. Clang, clang, clang. Why, it was almost like music! A new note, a new drop of copper or silver, was added to the jar each week. Sometimes it was change from the grocers. Sometimes it was a penny she had found on the sidewalk in front of Gottschalks. Once it was a quarter she found in her couch. By 1975, the jar was as full as it could be and Alice was 87 years old. And then one Sunday, she heard Randy’s parents tell the congregation that he would be home soon. He might even be in church the following Sunday! So Alice went home and searched all about her trailer for what she was certain must still be there somewhere. Back too many years ago to count, she wore a yellow ribbon. I never did learn the details, but I’ve heard that she might have used it in her hair on her first date with the man she married. Whatever its original use, that yellow ribbon now had a new purpose, just like the jar, if only she could… Aha! She found it in the top drawer of her nightstand, tucked inside a book of Robert Frost poetry. As you might have already guessed, she replaced the lid on the penny jar and tied the yellow ribbon beneath the lid. When she saw him next Sunday, she wanted him to know that she had been thinking of him all those days and weeks and months and years – those moments – when he had been in Vietnam. Have you ever been given a gift that you were grateful for in the moment, but you more fully appreciated as time went by? That's what the following short story is about. As my parents would say (quoting the movie Christmas Vacation), "It's the gift that keeps on giving all year long." And while that quote is taken from a humorous context, I think some seemingly simple gifts really do keep on giving and giving and giving. It is my hope that this story is another way for a gift given to me once upon a time to be poured out to you, dear readers. In memory of Jim Worthen. Only the Lord knows how much of your heart went into that jar of pennies, but I'll be forever grateful for the kindness you showed me. If you and I were there to see the jar when it sat on the shelf in the cellar, neither of us would come to the conclusion that it would one day be a symbol of hope. After all, one does not normally equate canned rutabaga with anything beautiful – or anything much at all. But once the rutabagas were removed, and the jar was washed inside and out, you might have seen a glimmer of its destiny in the way the sunlight poured through it as it dried on the kitchen windowsill. The jar was left there to dry after the announcement that Randy was drafted. As soon as Alice came back from church that Sunday, she knew she needed the jar for something more important than rutabagas. (Mind you, some people might consider rutabagas important. But Alice was not one of those people.) If we looked closely, we would have seen a few tears reflecting the sunlight as they traversed her weathered and wrinkled face that Sunday afternoon. Randy reminded her so much of the grandson she had lost during the Korean War. That was almost twenty years earlier, back in 1952. After her only grandson’s passing, Alice had started bringing candy to church in the pockets of her large purple coat with the lacy trim. Randy and his family sat in the pew in front of her. Sometimes the only smile she could find in those weeks and months after losing Mark was when she saw Randy’s smile as she held out the candy in her small palm. Of course, Randy was a young man by this time in 1971. He didn’t need candy anymore. And as much as he appreciated Alice’s kindness through his growing-up years, he had been a bit preoccupied at church that day. He forgot to give Alice a hug like he always did after the service. But don’t worry – Alice was not the kind of woman to hold such a thing against a young man consumed with thoughts of war and leaving home and horrors he couldn’t even imagine yet. Instead, she had returned to her little trailer and prepared the jar for its new purpose. Tomorrow I'm going to start a three-part post in honor of Thanksgiving week. It's a short story called "The Jar" that I wrote in three installments. While it is a work of fiction, it's inspired by a few real elements from my own life, and it's dedicated to someone whose kindness I'm very grateful for. I hope you are blessed by the story! With all of the homework and reading and blogging I've been doing this month, I really haven't done much of anything for my nano-NaNoWriMo project. And while I'm disappointed in myself for even making the challenge and not putting forth more effort to follow through on it, I'm hoping the Civil War poem, this short story, and possibly another short story for the BB (still not for sure on that one, so mum's the word!) will inspire and encourage you! Leave a comment with your e-mail address saying you'd like to be entered. (Optional) Answer the following questions: Do you prefer reading stories from a first-person or third-person perspective? And what are your thoughts on omniscient narrators? You must have a U.S. mailing address (due to shipping costs). The winner will be announced on Monday, November 28th. Want to know more about my giveaway policies? Scroll down to the very bottom of the blog! "Priscilla White knows she'll never be a wife or mother and feels God's call to the mission field in India. Dr. Eli Ernest is back from Oregon Country only long enough to raise awareness of missions to the natives before heading out West once more. But then Priscilla and Eli both receive news from the mission board: No longer will they send unmarried men and women into the field. Left scrambling for options, the two realize the other might be the answer to their needs. Priscilla and Eli agree to a partnership, a marriage in name only that will allow them to follow God's leading into the mission field. But as they journey west, this decision will be tested by the hardships of the trip and by the unexpected turnings of their hearts." 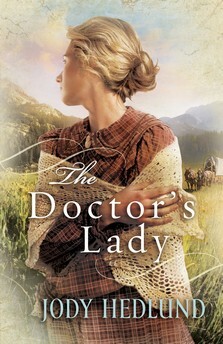 The Doctor's Lady is about a long, difficult journey to Oregon Country and to the realization of God's powerful work through "unlikely" people and in "unlikely" circumstances. Rooted in the true story of Marcus and Narcissa Whitman, this fictional retelling blossoms into a grand piece in its own right. It's hopeful, heart-pounding, and humbling! Eli and Priscilla deal with romantic tension with a capital "T" as their journey brings them closer together but their stubbornness and misunderstandings keep them apart. Gentleness, sweetness, anxiety, suffering, trouble, and revelations abound throughout the plot, made all the more meaningful by some complex and admirable secondary characters. Details from research add a painful and yet engaging dimension to the story. 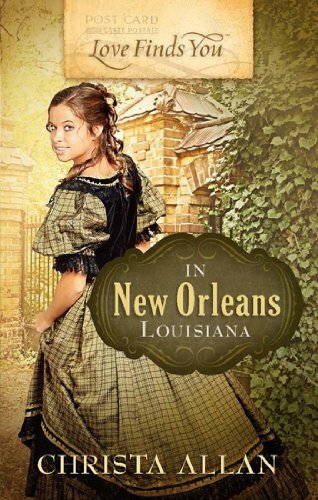 A beautiful, thoroughly engrossing book, this is one journey fans of historical romance (especially those with a fascination of the American West) won't want to miss! "Can one Christmas change a life forever? 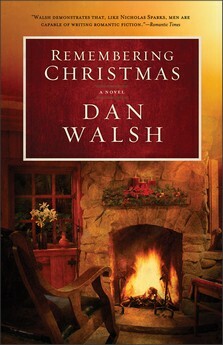 With skillful storytelling, Dan Walsh creates a Christmas story that will have you remembering every good and perfect gift of Christmas." Remembering Christmas is a life-affirming, hopeful Christmas story. The hero, Rick, is introduced as a frustrating, inconsiderate, self-centered man - whose attitudes and actions aren't so unfamiliar after all. He learns some valuable lessons about compassion and understanding as Walsh twists all the characters' lives into one lovely braid of a book. For some, the holiday season is spent in hospital halls or out on the streets, homeless. And yet hope remains, and God is at work even in the suffering - perhaps especially so. Remembering Christmas gives the reader glimpses at people in very different places in life, and it shows the privilege of sharing the cheer of Christmas with others. With some romance, some good old-fashioned home-style Christmas, and a transformed heart, this is a sweet book to read at Christmastime or anytime you want to remember Christmas! "After many dela ys caused by cavalry raids in their rear, Rosecrans's 42,000 troops marched from Nashville the day after Christmas to confront Bragg's 36,000-strong Army of Tennessee at Murfreesboro. They found the Confederates drawn up astride Stones River, a shallow stream a mile northwest of town. On the night of December 30, the two armies bivouacked only a few hundred yards apart. Their bands engaged in a musical battle in the still winter air, one side blaring out 'Dixie' in challenge to the other's 'Yankee Doodle,' and so on. Finally, one band began to play 'Home, Sweet Home.' Others took it up until all the bands in both armies were playing and thousands of soldiers, Yankees and Rebels together, sang the familiar words. Perhaps some of them wondered at the tragic irony of a war in which they could sing together one night and butcher each other on the morrow." What a bitter-sweet, heart-breaking moment in history! Around 620,000 men died during the Civil War. 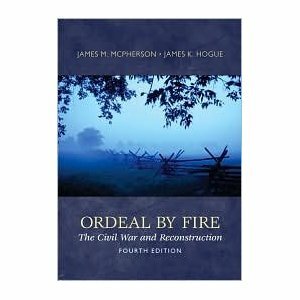 Destruction and death were part of the results of the country's divide. The following is a poem I wrote that was inspired by that "battle of the bands." Perhaps you're in a place like me, where you're desperately trying to grab hold of the future - symbolized by the North and progress. Or perhaps you're clinging tight to the past and all its pain or former "glory" - symbolized by the South. This poem isn't polished or perfect by any means. But I thought I would share it with you now anyway. As C.S. Lewis noted, “If we find ourselves with a desire that nothing in this world can satisfy, the most probable explanation is that we were made for another world.” We all long for a forever Home, and nothing here on earth can satisfy that desire. So may that night in the middle of the Civil War remind us of the beauty in an eternity far beyond and yet very near our everyday lives. Look away, dear brother, look away. Chases sweet melodies away. Away. Beneath stars you never can reach. Let those songs fade away. Away. In the window not so far away. This week continues the series with a discussion of Rodgers and Hammerstein's Cinderella (specifically our school's current production, which is fabulous!). Come join the fun! In the future, if you want to check out what's going on with this series, just click the button in the sidebar, just above my "Seasons of Humility" button! Let's see what we can learn . . . where the past meets the present! In honor of Veterans' Day, today's guest is Vince Mooney, who has some wonderful advice to share with anyone interested in writing military romance (or anyone who just wants to learn more about how the military works!). Meet Vince: "Born in Lon g Island, New York, have lived in New Jersey, Connecticut, Arizona, California, and Oklahoma. Lived three years in Italy and Germany while in USAF. (Air Police: K-9 section). Now live in Tulsa, Oklahoma. Married after whirlwind romance to same wife for over 30 years. Currently run my own real estate school in Oklahoma. Like to study foreign languages for a few months just to see how they work. Also like Latin and giving speeches. I’ve taught Philosophy, Advertising, Property Management, and many real estate subjects at the University, Community College, and Technical School level. 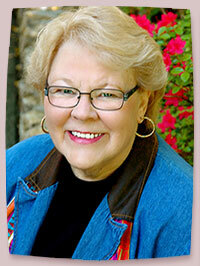 Now writing non-fiction book on the Romance genre. I was trained to be a philosopher and history teacher but have worked mostly in advertising, marketing, and real estate." You can learn more about Vince at his blog Philosophy of Romance. It can be very difficult for me to read a military romance because there are sometimes enough mistakes to repeatedly pull me out of the story. This does not have to be the case. I’ve read many military romances by Maureen Child with complete satisfaction. She must have a very good military fact checker. But then, even a good military fact checker will usually only catch mistakes. He won’t suggest the kind of additions that should also be in the story if it is to be true to life. 1. Get the ranks right. I read one romance where the author thought a sergeant major outranked a Captain. She had the Captain jump up and salute the sergeant. This just destroys the writer’s credibility. Here is where you can check ranks. Here is where you can get an idea of Army time-in-grade requirements before being promoted to the next rank. You can find other sites for Navy and Air Force. Remember: some services do not have some ranks. I only saw one Warrant Office my whole time in the Air Force. I don’t believe there are any left. 3. Put military ‘annoyances’ into the story. I’ve read a whole series of military romances where you would swear the Airman had civilian jobs. They’d go to work like they were going to a civilian office. They would take days off or afternoons off as they needed for their personal reasons. That’s not military life. Troops also have to take their exercise tests each year (this could be more often now). Another ‘hot issue’ that comes up a few times a year is who is going to be promoted and how will they react? (I’ve seen airman who were so mad they were not promoted that they went around kicking holes in the walls.) I don’t think I’ve ever seen troops looking at the posted promotion lists in a romance. This is a big deal. If your story spans a full year, this would have come up in real life. There are also medical exams and shots to take as well as qualifying on the rifle range. There are inspections and sometimes the Inspector General flies in to check the post out. These inspections are supposed to be a surprise but we always knew when it was going to happen. Air Police pretty much knew what was going on. 4. Consider describing the colorful patches on the uniform of your hero or heroine. For example, if you have an Air Force Pararescue member, check out what the patch looks like here. Soldiers and airman are proud of their units. I was in the Air Police K-9 corps and we had a patch we were very proud of. 5. Have some saluting going on every once in a while to give the story a military flavor. I’ve read military romances where I don’t believe there was even one salute in the whole story. 7. Remember: personnel rotate every few years. Don’t have people on the post who have had the same military position for ten years. Troops are rotated every few years so they can get a fresh start every so often. Even a bad commander, who you can’t stand, may be gone in a year or two or you might be going to a new base in a few months yourself. This rotation makes it easier to put up with things that you would otherwise consider to be intolerable if you knew things would never change. 8. Troops who vote will often use absentee ballots. 9. There is usually some talk about getting out of the service or re-upping. “He’s a lifer” is often said about a career solider. Use a little slang like, RHIP: rank has its privilege. This is used quite often. 10. Talk about benefits and education. There are bonuses to re-up and money to pay for part of college tuition. Your hero could be going to college in the military. It could be a reason why he will not leave the service. Use only a little of the above suggestions. In no way would I suggest that the above is a checklist a writer must compete when writing a military story. Most romance readers are woman and most women have not been in the military. A writer does not have to do any of things I recommend above. I realize that the romance is the central focus of the story. However, if some of the above items are included in the story, then the story will seem more real and the reader will get an insight into military life that she did not have before reading the story. One more thing: being late to work is being AWOL. Don’t have your service people coming late to work like it wasn’t a big deal. This does drive me crazy. Amber's Parting Comments: Thank you so much for the helpful information, Vince! And thank you for your service to our country. May we honor our military men and women this day and every day for the sacrifices they make or have made on our behalf. I wrote the poem that served as the inspiration for the title of this blog on a train trip I took my first semester of college. I was feeling quite stressed at the time with studies, being in the school musical, and uncertainties regarding God's plans for my life - so I up and decided to take a round trip one-day train ride. The destination didn't matter; I just wanted to go somewhere where it would be just me and God. It was a wonderful experience for me (if a bit more spontaneous of me than normal! ), and I cherish that memory. "Come unto me, all ye that labour and are heavy laden, and I will give you rest. Take my yoke upon you and learn of me; for I am meek and lowly in heart: and ye shall find rest unto your souls. For my yoke is easy, and my burden is light." "And straightway Jesus constrained his disciples to get into a ship, and to go before him unto the other side, while he sent the multitudes away. And when he had sent the multitudes away, he went up into a mountain apart to pray: and when the evening was come, he was there alone." Valley of Dreams has a very interesting premise, and the uniqueness of the setting and characters is commendable. Fans of all things American West should find this to be an enjoyable excursion. Since this is the first book in a series, it's nice to have this introduction and insight into Cassie's story, as well as the Engstroms' lives. 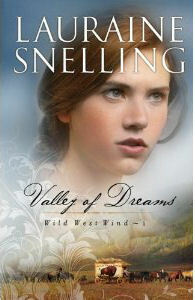 However, Valley of Dreams seems almost like a very long prologue rather than a story of its own. Cassie's character does grow a little bit, but overall the book feels like it's providing back story rather than the actual meat of the plot. The way the book ends (with some mystery and a bit of suspense) suggests that the second book, Whispers in the Wind (scheduled to release August 2012), will probably be where the more in-depth action and drama really starts, although this is not guaranteed. The entirety of the book is mostly "rising action" or "building tension," as the reader is introduced to two groups, Cassie's troupe and the Engstrom family, waiting for their lives to finally cross. Some of the secondary characters, like Chief and Micah, have real potential, but come across a little flat - although there's a hint at the end that there's more to the ever-quiet and to-the-point Chief than meets the eye. The various reverends and their wives are all very similar with little to distinguish one from the other, and even the apparent hero and heroine didn't completely charm me. The "pets" are a nice addition, though - adding some sweetness with their intriguing names and their gentle presence. This story includes quite a few details about daily life in the Dakotas at the turn of the century, which is nice but doesn't always move the plot forward. The ending does ultimately stir up the reader's curiosity, and if one is willing to invest a little time in this first book, it seems like this will be a sweet and clever series overall. "While still mourning the loss of her husband and daughter, recently widowed Ellie King (Natalie Hall) visits her brother Aaron Davis (Greg Vaughan) and his children for Christmas. Ellie does her best to enjoy the holidays, even making new friends with Mrs. Thompson (JoBeth Williams), a local shop keeper, and handsome admirer Deputy Strode (Dylan Bruce). Settling in nicely with her brother's family, Ellie also meets Erik (Bobby Campo), a young man abandoned by his outlaw father whom Aaron has taken in as one of his own. When Aaron travels out of town to purchase adjacent land for farming, Ellie agrees to watch his children, but the season’s festivities are threatened when Aaron goes missing." 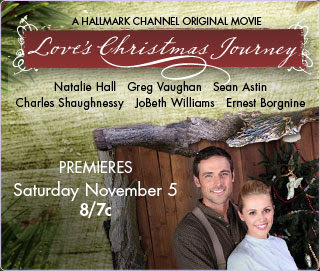 Love's Christmas Journey is a new two-part, four-hour journey Love Comes Softly fans won't want to miss! While the two new prequels that aired back in September and October on Hallmark Channel (Love Begins and Love's Everlasting Courage) were sweet, they really were lacking a certain depth and quality that made the first few movies of the series great. With the last two additions being rather disappointing, I wasn't expecting too much with this latest, much longer movie. I am happy to report that I was pleasantly surprised! As more movies kept being added on to the series, I thought it was sad not to learn more about Missy's brothers (introduced in Love Comes Softly and Love's Enduring Promise). They simply seemed to vanish, even when Clark and Marty (Missy's father and stepmother) still came back off and on throughout the first six movies. I was so excited to learn that Love's Christmas Journey brought back Aaron (Missy's younger stepbrother)! And not only Aaron, but a yet-to-be-introduced younger sister named Ellie, who has a heartbreaking but ultimately hopeful story of her own. Yes, there is a bit of cheesy acting, which isn't so bad in a feel-good Christmas movie. But overall the acting is very good! I love that Sean Astin (of Lord of the Rings fame - Samwise Gamgee!) is the mayor!! And I knew a certain man in town looked familiar... Mr. Cunningham is none other than the actor (Stephen Bridgewater) who played Mr. Taylorson in Love's Long Journey and Love's Abiding Joy! How fun is that?? This movie packs an emotional punch, then wraps up the hurting in a great big group hug and a pretty red bow. And I enjoyed every minute! There's some Wild West-fighting tension that made me cringe and cry out, some adorable children scenes, and some romantic moments that made me go "Awww!" and smile. Love Comes Softly fans will recognize much of the background music, as well as a few references to Clark and Marty. With themes of justice, generosity, and hope, this is a great Christmas romantic Western to watch with your girl friends or family this season. Want to learn more about the movie and the whole Love Comes Softly movie series? Visit the Hallmark Channel website! "From Christy and RITA Award-winning author Tamera Alexander comes a novel about the difference between knowing who you are--and knowing who you want to become. Set at Nashville's historic Belmont Mansion, a stunning antebellum manor built by Mrs. Adelicia Acklen, A Lasting Impression is a sweeping love story about a nation mending after war, the redemption of those wounded, and the courage of a man and woman to see themselves--and each other--for who they really are." Tamera Alexander paints vivid and detailed images with her words, and A Lasting Impression is an exquisite showcase of her talent. Although sometimes the specifics of her stories become vague in memory over time, the reader is left with beautiful, emotion-filled impressions that endure. This particular story is quiet grand in scope - a much different setting than her previous novels, set in a luxurious world of art and parties and finery. And yet Alexander shows that no matter the setting - be it the wilds of Colorado or the wilds of the gossip-hungry social elite - suffering is a part of the human condition. Back story and historical background are woven in throughout the story in an engaging way, making the characters all the more authentic. Alexander explores various impressions and misjudgments throughout the pages, and she keeps the tension going right up to the very end. All of her characters have something to add to the story, and together they make up an oftentimes frustrating, but also wonderful, cast! From cover to cover this is a gorgeous novel, encouraging the reader to look beyond first impressions and reach out to the hearts of others with forgiveness and compassion. 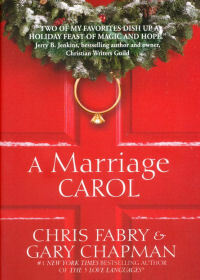 The romance is sweet and yet powerful, and the lessons on truth and a new beginning in Christ are inspiring. This is another Tamera Alexander masterpiece that shines! Click HERE to read my original post for the CFBA blog tour, which includes information about the author. 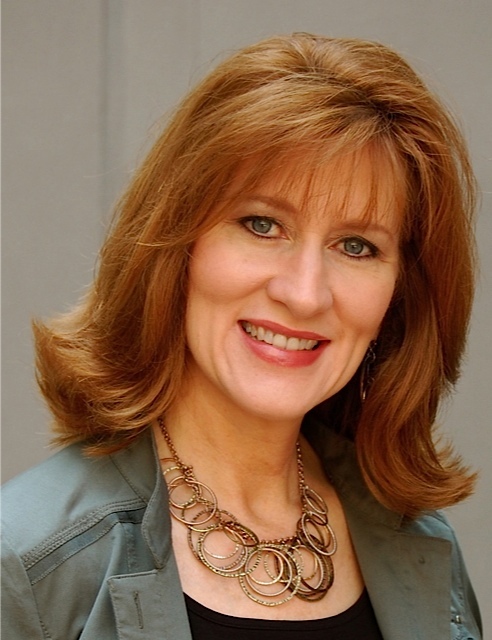 Tamera Alexander is the best-selling author of Rekindled, Revealed and Remembered, the critically acclaimed Fountain Creek Chronicles historical series with Bethany House Publishers. Her second historical series, Timber Ridge Reflections (From a Distance, Beyond This Moment, and Within My Heart) continue her signature style of deeply drawn characters, thought-provoking plots, and poignant prose which has earned her devoted readers—and multiple industry awards. These awards include the 2009 and 2008 Christy Award for Excellence in Christian Fiction, the 2010 and 2007 RITA Award for Best Inspirational Romance, the 2010 and 2007 Gayle Wilson Award of Excellence, the 2010 HOLT Medallion, the 2007 Bookseller’s Best Award, the 2007 National Reader's Choice Award, and Library Journal’s Top Christian Fiction for 2006, among others. 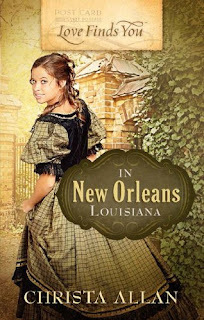 Tamera's newest novel A Lasting Impression is the first of a brand new three-book Southern historical series, and the first two chapters are available for review. She's at work on her ninth novel which will release in fall 2012. After living in Colorado for seventeen years, Tamera has returned to her Southern roots. She and her husband now make their home in Nashville, Tennessee, along with Tamera's father, Doug, and with their two adult children who live near by. And don't forget Jack, their precious--and precocious--silky terrier. If you would like to read the first chapter of A Lasting Impression, go HERE. I'm about 2/3 of the way through the book, and I'm loving it! Tamera Alexander's writing is so detailed and beautiful, and this story is emotion-packed and engaging. I'm hoping to finish this today/tonight and have a full review posted tomorrow. Eager to find out how Alexander brings everything together! The answer is a simple one for a Christian, in theory: God. He's the One whose love and grace gives us worth and our lives meaning. And yet as we talked about self-worth and self-esteem in my Personality Theory class today, I realized that I don't always live that way. We read and discussed an article about the various contingencies of self-worth (i.e. : finding our value through different avenues). This includes everything from academics to our appearance. When we determine our value through those factors, then we tend to interpret our successes and our failures as adding to or detracting from our worth as a person. This can also include writing. The article mentioned that if we find our self-worth through a certain avenue and then we are criticized in it, we shut down and do our best to avoid the criticism or make excuses. Why? Because when we find our self-worth in something besides God, then any perceived "failure" on our parts will make us feel like we have little value. And I am guilty of acting in this way. I really strongly dislike criticism and do my best to avoid it or ignore it. But you want to know something? Authors are supposed to thrive on criticism and editing! I react in revulsion. If I ask for a critique, what I'm really asking for is validation and a pat on the back. I just want others to tell me that I'm brilliant and I'm definitely heading in the right direction. It's sad, but true. And I'm the same way with academics - I often put a lot more emphasis on grades than on actual learning. But if we really truly believe that our worth is found in God alone - in His unconditional love and His purpose for our lives - then criticism isn't something to fear. We don't have to be in competition with others or be the very best at something in order to have value. Does that mean we simply don't try to succeed, though? Not at all! Yet success is redefined when we strive for an eternal perspective. And no matter whether we fail or succeed, God is at work, He should be glorified, and we should be at rest knowing that His love never changes. If He wants me to write a book, then I should weigh advice, give it my all, and forget comparing myself to others (in their writing speed, awards, publication, etc.). And one more thing: the article addresses an "antidote" for all the issues surrounding the self-esteem issue. The antidote is to focus on others and to be a part of something bigger than yourself. And that's just what loving and serving God is - being a part of God's eternal plan as He calls us to love and serve others and to give Him the glory. Isn't it wondrous to know your worth is in the hands of a God who lovingly created you and has a purpose for your life? "For I say, through the grace given unto me, to every man that is among you, not to think of yourself more highly than he ought to think; but to think soberly, according as God hath dealt to every man the measure of faith." "And the kingdom of heaven is like unto a merchant man, seeking goodly pearls: who, when he had found one pearl of great price, went and sold all that he had, and bought it." 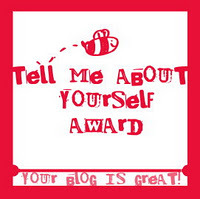 Tell Me About Yourself - Blog Award! Thank you, Katie from Legacy of a Writer, for passing on the "Tell Me About Yourself" award to my blog! Katie's blog is lovely with lots of fun things going on all the time, so be sure to visit her if you haven't already! I just joined Twitter recently (@SeasonsHumility). Congratulations, ladies! You all have great blogs, and I appreciate your friendship - as well as the friendship of all my blogging buddies!! P.S. If you haven't seen the update page yet, I recently added the tentative schedule to the Love Finds You Blog Party page if you're interested in seeing some of the fun we have in store! Can't wait to party with ya'll!! Today, back by popular demand (again! 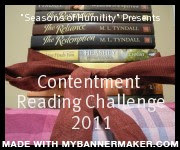 ), let's welcome another round of the Contentment Reading Challenge Book Swap! To save me a bit of time, as well as to make sure we're all on the same page, I'm just going to repeat the book swap guidelines from the last two swaps (in March and in June). I'm willing to be flexible, so feel free to just let me know if one of my books sounds good to you, and we can go from there. =) And go ahead and post your lists and see if there's anyone you want to swap with! November is National Novel Writing Month (NaNoWriMo). Thinking realistically, I know it wouldn't be practical for me to fully participate in the challenge to write a 50,000-words novel in a month, especially since I have papers to write, other homework to complete, and books to review all month long. But I like the carpe diem aspect of this challenge - "seizing the day" and refusing to put off writing goals in spite of a never-ending to-do list. So I've decided to have a nano-NaNoWriMo challenge for myself. "a combining form with the meaning 'very small, minute,' used in the formation of compound words (nanoplankton)..."
So my NaNoWriMo challenge is a "very small" one (as compared to writing 50,000 words): I'm going to edit my first manuscript. I'll be doing some writing and tweaking, and I'll be working on a novel, so I'll pretend it still counts. ;) I'm not going to be official about this or anything. I've just been putting off editing for so long that I want to use this month's theme as inspiration for finally going back to my first manuscript. If I don't get around to finishing the edits, I give myself permission to be merciful. I just want to be heading in the right direction. How about you? Anyone out there taking on the full NaNoWriMo challenge? Anyone want to join me in doing a "nano" version of the challenge?